A small town feeling with plenty of space to roam free: that’s how the residents of Dunnellon approach their way of life, and if you’re in the market, there are a diverse selection of Dunnellon homes for sale! Once a booming mining town, Dunnellon, Florida has since prospered as a residential nirvana, where people can relax, enjoy the great outdoors, and get reasserted in their lives. 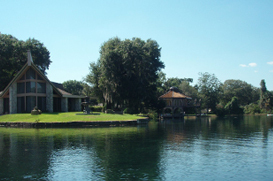 Founded in 1887, Dunnellon real estate used to be based solely around prospecting phosphate. The gorgeous Rainbow River was the main source of this resource, although these days the river, formerly called Blue Run, is the perfect setting for leisurely picnics with the family and other outdoor activities. If you think that Dunnellon looks familiar, it’s probably because you’ve seen it on the big screen! The major motion picture that launched a franchise, Jeepers Creepers, was filmed on location in Dunnellon. Just think – you have the chance to live where a Hollywood blockbuster was filmed! Major roadways bleed through Dunnellon, such as US 41 and Marion County Road 484, connecting you to larger cities. With the solidified economy and the great retail providers located within the city limits, however, everything you could ever need is right outside your door and just a short drive away. Blue Run Park runs alongside the Rainbow River and serves as a destination point for wayward tourists who love to blaze the many trails throughout the park. Biking, boating, hiking…with the fresh air and comfortable climate this park is a favorite spot for locals and visitors alike. See the majestic bald cypress, bays, red maples, and other lush vegetation as you lose yourself in the immense woods. Come across a scurrying otter and his family, or watch the rare birds shooting through the sky! Whether you’re planning your retirement in a relaxing community, or you just want to enjoy the open fields and sunshine that only Dunnellon real estate can provide, contact Realty Executives soon to see what kind of opportunities are available. They’re the local experts that value great customer service above all else, and they can pull together tons of information for you very quickly!